Retailers in Australia such as EB Games had started taking pre-orders back in August for the Skyward Sword bundle. However, it took Nintendo of Australia nearly two weeks to give an official press release concerning the bundle. 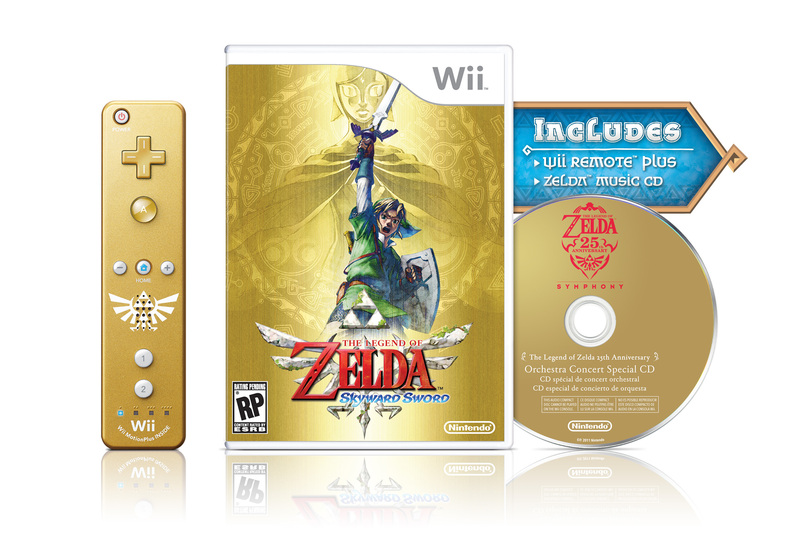 Like all the other bundles, it will include a copy of Skyward Sword, the CD with songs from The Legend of Zelda 25th Anniversary Symphony, and the golden Wii Remote Plus. However, this bundle is only available while supplies last. For those of you who already have a Wii Remote Plus or Wii Motion Plus, you can still get a copy of Skyward Sword and the Zelda Symphony CD just by pre-ordering. Personally, I’ll be getting the bundle as I want the golden Wii Remote Plus, but it is nice to see Nintendo is offering multiple deals. Unfortunately there is no release date yet for Australia. Strangely, Nintendo of Australia is also saying there is no price for the bundle, even though EB Games has the bundled priced at $118 and the regular version priced at $98. Jump inside to see the full press release. 2011 is the year of Zelda with Nintendo celebrating 25 years since the beginning of the critically-acclaimed franchise. The Legend of Zelda was first released on the Nintendo Entertainment System a quarter of a century ago this year, and to help celebrate this occasion Nintendo are releasing a special limited edition bundle for the latest instalment in The Legend of Zelda franchise, The Legend of Zelda: Skyward Sword. The special limited edition bundle features a copy of the game, the music CD featuring selected songs from The Legend of Zelda 25th Anniversary Symphony, and a rare golden* Wii Remote Plus controller bearing the Hylian Crest. You’ll need to be quick off the mark, as this limited edition is only available while stocks last. For those that miss out, also available for a limited time only will be a copy of the game, The Legend of Zelda: Skyward Sword and the music CD (no Wii Remote Plus controller). The stand-alone game of The Legend of Zelda: Skyward Sword will be available following the release of the two limited edition versions. Games in The Legend of Zelda series invite players to explore vast environments, solve puzzles and battle enemies in a fantasy world. The Legend of Zelda: Skyward Sword continues this tradition, but transforms the experience by using the Wii Remote Plus controller to offer even more precise control. The Legend of Zelda: Skyward Sword release date and price will be announced on a future date. For more information on The Legend of Zelda: Skyward Sword, visit the official The Legend of Zelda: Skyward Sword website.